Muscles are something that women want to have, but only in small amounts. We live in a society where slim and fair skinned arms are considered beautiful. Some girls want to work out, but don't want the muscles that come with it, afraid that they may come off as too masculine. But that was before. Now, the Philippines is starting to recognize that strong is beautiful—thanks in large part to the number of medals our female athletes have brought back to the country. 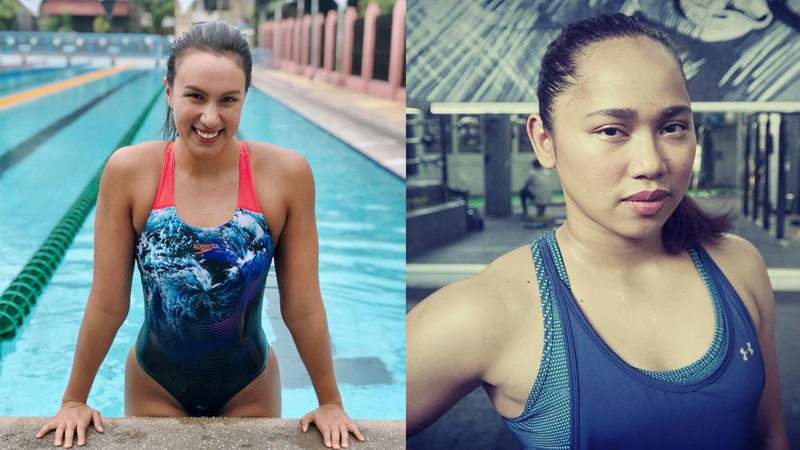 We had the opportunity to get to know a few of the best Pinay women in the sports and fitness industry. And here, they share their experiences to help you understand, respect, and appreciate how strength can make you sexier and more badass. Why did you decide to go into weightlifting? Nakita ko ang mga pinsan ko na nagbubuhat at na-curious ako. Introvert ako at sa weightlifting ko naramdaman ang love and fulfillment. When your body started to develop for weightlifting, did you ever feel uncomfortable? How did you build your confidence? Nagsimula pa lang ako sa weightlifting medyo uncomfortable na ako. Bakit? Sinasabihan nila ako na ‘Wag ka diyan, di ka mabubuntis. Wag ka diyan, di ka na magkaboyfriend. Wag ka diyan, magiging macho ka.’ Dahil dun, lumaki akong insecure sa katawan ko. Pero nung time na down na down yung career ko at ako, I said to myself na kaya ako macho kasi weightlifter ako, at di ako magiging kung ano ako ngayon kung hindi ko tanggap kung ano ang meron ako. Why is it important to love your body? Paano ka magbigay kung sa sarili mo wala ka maibigay? Mahalin muna ang sarili then yung sobrang pagmamahal sa sarili, yun ang ibibigay natin sa mga nakapaligid sa atin. Always prioritize your health, body, and yourself. What are the struggles of having a swimmer’s body that you learned to appreciate? Having broad shoulders is on top of the list! Swimmers have a strong upper body, really muscular and defined back, and broad shoulders. Although honestly, it took me years (specifically later in my teen years) to appreciate my physique. But whenever I get compliments about how strong I look and how broad my shoulders are, I started to appreciate and love what I once thought was unattractive. And hey, it just shows how hard I work and how dedicated I am to my craft. How has being an Olympic Swimmer changed your outlook on beauty and body positivity? Being in the Olympics showed me the best athletes around the world and it opened my eyes to what beauty is. At the Olympics, athletes have the perfect bodies for each of their sport but not all are deemed to be beautiful by society. Beauty is definitely what's in your heart and who you are on the inside. The Olympics is full of athletes with different shapes and sizes but all are equally beautiful. All seem to carry themselves with confidence. Watching and talking to different athletes you can tell how much passion, determination, love of country each person has. I realized that no matter your size or appearance, beauty is learning to love yourself and choosing to see the beauty in others beyond their physical appearance. How do you embrace body diversity? What should an individual understand to fully appreciate that beauty comes in different shapes and sizes. Have an open mind that beauty comes in all shapes and sizes. True beauty is how comfortable we are in our own skin and how we can make others feel comfortable in their own. Triathlon, just like any other sport, requires a lot of discipline even outside training. What were the things that you had to give up in order to become successful in this sport? I would say that one of the most important things that I had to give up is my time for my family. I do not see them often because I am based in Nuvali when I’m in the Philippines or out of the country to attend training camps. When did you start loving your body and truly appreciating how strong it looks, what it can do, and how it allows you to enjoy life in general? In high school, I was somewhat shy because my classmates bullied me for my skin color and body type. But then, as I grew older, I learned not to listen to what other people think or say about me. I am thankful for my body because, with it, I was given the chance to represent my country. What are you most grateful for? What makes you a badass? I am grateful for the body that I have and all the things that I've been able to do because of it. I was able to travel, meet lots of wonderful people, experience different cultures, and taste different cuisines. Because of my body, my dedication to my training, I am able to bring honor to my country. This is what completes me as a person. I truly love the body that I am in and would not trade it for anything else. How did basketball affect you physically, mentally, emotionally and how did that impact your your self-confidence? I feel most attractive when I am on the basketball court and playing hoops. It’s one of the things I know best. I believe part of my self-confidence grew through putting in the time and effort to be a better basketball player. I think when you know what you’re good at, whether a sport, an instrument, a hobby, and find a way to tap into that mindset in other spheres of your life or new things, you’ll realize how awesome of a person you already are, beyond what you do! How can body diversity be embraced by people and how should the Filipina woman find confidence in herself regardless of shape, and size? Realize that everyone is unique and accept everyone’s uniqueness. I think it all starts with how you perceive yourself and learn to accept yourself, imperfections and all. I believe confidence comes through getting to know who you are, beyond what you look like and what you do. It’s a product of embracing the intangibles—character, your values, and the experiences you’ve persevered through. Despite the adversity and the challenges I’ve faced so far, I never gave up and came out a better person than before. I’m young, with a lot more experiences coming my way to learn from, so I’ve realized that I’m also a work in progress. As a person of faith, I know God made me in his perfect image. I’m the one and only Sofia Isabella Olalia Roman who will ever walk this Earth so I also take pride in that. When did you start playing football? As a young girl playing football, did you care about getting scratches, sunburn, and getting physical? I started playing football when I was 13 years old. It was a newly opened sports club in my high school and my friends and I decided to join the club as an after class activity. I’ve always been the athletic- outdoor type of girl so I loved running around, getting physical, and playing under the sun. How did the competitiveness of football impact your personality? How did it toughen you up to become a badass? Being a competitive person, I enjoyed the challenges and the physicality of the sport. It taught me to be strong and confident, to stand my own ground and yet work with my teammates. Football taught me to be mentally, emotionally, physically and spiritually tough. Despite injuries and setbacks, football taught me to always bounce back and never give up. I believe that the sport toughened me up and made me realize that I can cope with whatever life throws at me. Football taught me to face my fears, take risks, never give up and have the courage to pursue my dreams and achieve my goals. As the coach for the Pilipinas U16 team, what life lessons do you teach your players off the pitch? How did you come to terms with loving the body that you have and how did that help you appreciate body diversity, that beauty comes in different shapes and sizes? It was in high school when I realized that each and every one of us have different body types. I have a bigger frame than most ladies—broad shoulders, and a not-so-curvy feature as well. I accepted the fact that I would only end up stressed and insecure if I kept my focus on trying to mold myself into society's ideal female body. I learned how to be content with my shape—for as long as it did not hinder me from performing well, I was happy. By then, the very same big-boned body gave me a lot of opportunities in my career in sports. By college and until my professional career, I gained a deeper understanding of how different body types have different strengths—a certain type of body could give one speed, power, or overall athleticism. Growing up with this insight gave me a healthy mindset of appreciating different body types as well as loving my own! There's beauty in every body: thick, thin, or lean! If someone came up to you and said that she is scared to have “too athletic” legs, what would you tell that person? I'd tell her that the only reason for being scared of athletic legs is finding a pair of jeans that could perfectly fit you in the right places. But even then, jeggings have been invented, so there's really no reason to be scared! I have athletic legs and these bad boys take me places—whether it be hiking to the top of Mt. Pulag or enduring one whole day of walking around Tokyo! In a society where beauty standards are not yet that open to diversity, what should women do and not do for them to love the skin that they’re in? I say own it—love your body! It's the only one you've got! If you're not too happy with it (and hopefully it's not simply because you don't look like those celebs you see on the 'Gram), stop making excuses and do something about it. Find what motivates you and when the going gets tough, stick to why you're there in the first place! If anything, look at it as an investment for your health. It would be nice to spend your 40's without starting to worry about getting sick. Who inspired you to get into bodybuilding? And what instance in your life made you get into the sport? My friends and family. They motivate and inspire me to do the best that I can. I was a skinny girl with poor posture and I also had mild scoliosis. That's the reason I decided to work out. Then eventually I was convinced to compete. Not only did I win awards but I was able to improve my physique and also my overall well-being. People have experienced body shaming for being underweight or overweight. Were you ever body shamed for having more muscle? How did you handle it? Yes, especially my Figure (category) days because I was more muscular then. But, it didn't bother me because I knew what I wanted and I was ready to accept what people might say whether good or bad. All of us have different views and opinions. And I respect that. What's more important is that I am happy with what I do and I inspire others. What do you love most about your body that was an effect of bodybuilding? Aside from having a great physique and winning competitions, it was through my lifestyle and character I built from being a bodybuilding athlete that I was able to gain more self-confidence and feel empowered as a woman. Crossfit is a physically demanding, high-intensity sport, and along with it comes changes in your body. We live in a very conservative society that’s at its infancy in terms of accepting body diversity. When you got into it, were you concerned at all that you were going to get muscular? When I first started Crossfit, I knew nothing. I just wanted to do something new because I’m athletic and competitive. Once I started being competitive at Crossfit and realizing what type of body shape I was about to have, at first it was a concern because in the Philippines it’s new. That’s one thing not a lot of people understand. But in the end, I have my goals, I have my dreams, and this is the body I have. If I get asked, “why do you have to lift so heavy?” Why not? This is where I want to be right now, this is what I want to do and I love it. How did being an athlete help you respect and appreciate all the more the diversity of women’s bodies? What I learned about being an athlete is all our bodies are different. No matter what sport you’re in or even if you don’t play any sport, your body type is your own. I have people I idolize, I want their arms or their abs but, I’m gonna be different. Our performance can be the same no matter what we look like and one thing I appreciate the most is that women are so strong. We’re tailored a certain way and we have advantages in some sports. Some people live their lives not knowing the full potential of their bodies and their strength and I just find that unbelievable. As an athlete, I realized how strong we women can be, and we can keep up with men (or even outwork them). To the women who are scared to lift and do intense physical activities because they are scared to grow muscle, can you tell them what they’re missing out on? If I get asked if someone should do CrossFit, my answer is, you never know until you try. I never knew I was going to love it until I tried it. Every athlete never knew they were going to love something until they tried. We only get this one chance to be young, to be strong, to do whatever we want in life. If it doesn’t work out, you didn’t waste time because you learned something new. And if it works out, it is gonna be the best experience of your life. We live in a society where people are still learning to embrace fitness, sports, and women who have the “thicc” and “strong” physiques. If a woman came up to you and said she does not want to get bulky or lift weights, how’d you take it and what would you tell them? How would you tell them that having this body is okay? As a coach, I get that a lot. Not a lot of women want to be bulky and that’s okay. Usually what I tell them is, let’s try lifting, and if you grow muscles and think that’s your limit, then we’ll stop. I assure you, out of the hundreds of women that I’ve coached, no one ever told me it’s enough. For women it takes a long, long while to build muscle, it’s not that simple, it’s not that easy. What milestone in your life made you realize that you love your body? I started winning in the Asian and World Championships, then I got into strongman where they’d make you do anything, like pulling trucks, carrying rocks. And I am just amazed at what my body could do. I never thought I could pull a truck with my bare hands. Why is this a good time to embrace body diversity? Women of all shapes and sizes are equally beautiful. For as long as you’re healthy and taking care of your body then you’re good. Social media helps us become aware of women from all over the world. Women of different ethnicities, sizes, who play different sports. Whatever it is we’re doing we should all respect each other, spread positivity and encourage women to do whatever they want.